Andros - and the adjacent island of Tinos - is part of the beautiful northern Cyclades and can be visited from quite a few charter ports, such as Samos, Syros, Lavrion, Poros and Athens. Note, that recently also Mykonos is becoming a charter base of importance. 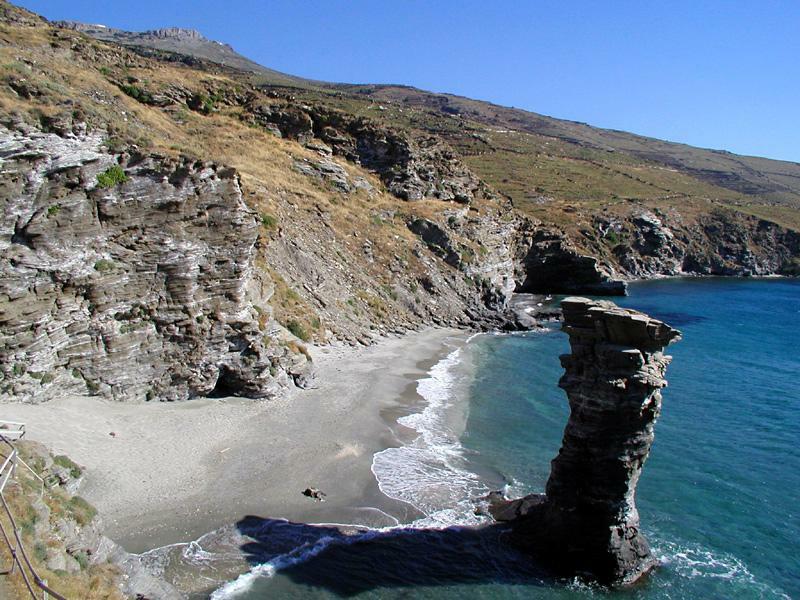 Both Tinos and Andros are situated in a wonderful sailing area, which allows you to cross towards the Dodecanese and the eastern Sporades too. The scenery and the magnificent beaches are the main attractions of these islands and besides the usual beach tourists and island hopping tourists, both isles are attractive and popular destinations for yachts and cruises. There are various options for sailing vacations in the northern Cyclades. First of all there is the bareboat option without a hired skipper or captain, which are the most popular sailing vacations because of the total freedom and privacy on these charters. A first step up towards the flotilla fleet are the assisted bareboat charters, which give you still a lot of freedom while enjoying the assistance from a lead crew. This is similar to a regular flotilla, that is unfortunately more rigid and involves a bigger fleet (sometimes more than 12 yachts). The more luxurious and comfortable way of cruising these waters is on fully crewed yacht charters. The most important are the endemic graceful vessels called gulets, goulettes or gullets: wooden motor sailers offering great atmosphere and style. But also the ubiquitous super yachts and mega yachts can be hired to cruise the Aegean, and the Cyclades in particular. Although not as stylish to some, these brilliant yachts offer even more luxury and comfort during your sailing vacations. Naturally, with each one of these yachts you will be able to anchor metres away from the most pristine beaches Andros has to offer, see photo.
.: Back to Andros sailing vacations:.